Since the beginning of the year, I’ve been on full organization mode. 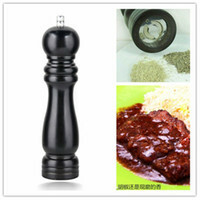 You know: getting rid of clutter and finding a place a proper place for everything. One of the easiest clean-ups jobs was all done electronically. It was mostly clearing my email box to a respectable level (I’m finally answering emails again!) and digital files. Among those digital files I found were my life goals that I set up in 2011. Yeesh! Go to Galapagos Islands and swim with marine iguanas. Hurm. It seems that the two of those goals can’t happen without the other one. In any case, I won’t be seeing Australia for a while and to tamper my urge to put a big dent on my credit card with travel plans, I’ll be content with making a batch of Lamingtons for the time being. 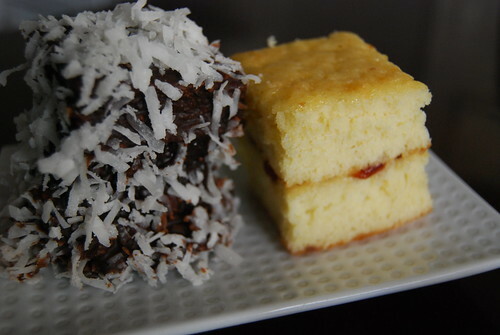 Lamingtons are an Australian dessert, consisting of squares of cake coated in chocolate and rolled in coconut. According to internet research, it’s very popular in the land down under and commonplace in bake sales. In addition, it’s also the cousin of the chocolate coconut bars I had in Cleveland a few years ago. I turned to Martha Stewart. She can do no wrong. Well, unless it has to do with insider trading. Her recipe uses shredded sweetened coconut and strawberry jam in between layers the vanilla layer cake. Turns out that adding the jam included a difficult step to an already difficult dessert. 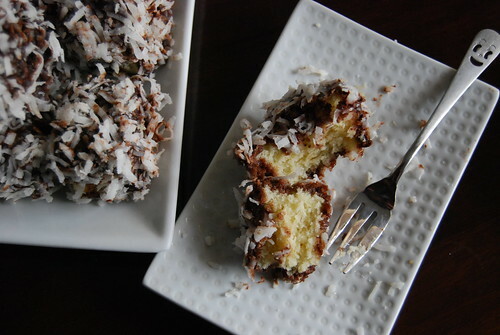 It requires dipping layered cake into icing followed by rolling it in shredded coconut. I opted to do a few Lamingtons with a jam filling. The rest (cake dipped in icing and rolled in coconut) was just as delicious. Preheat oven to 325 degrees F. Butter two 9-by-13-inch baking pans; line bottoms with parchment; butter the parchment. Cream together butter and sugar until light and fluffy, about 3 minutes. Add vanilla and eggs, one at a time; beat until incorporated. Sift together flour, baking powder, and salt; add to egg mixture in three additions, alternating with the milk and beginning and ending with the flour mixture. Divide batter between prepared pans. Place in oven; bake until a cake tester inserted into middles comes out clean, about 30 minutes. Cool slightly on wire racks; remove from pans. Turn out cakes onto racks; cool completely. Optional: spread one of the cooled cakes with the jam; place other cake on top. Using a serrated knife, trim edges of sandwiched cakes; cut into 24 two-inch squares. Place the coconut in a medium bowl; set aside. For icing: Place the milk and butter in a small saucepan over medium heat, and heat until butter is melted. Transfer to a medium heat-proof bowl; add the vanilla extract, confectioners sugar, and cocoa powder. Stir until combined. Place cake squares in the bowl of chocolate icing; using forks (in my case chopsticks) to turn the square and coat all sides. 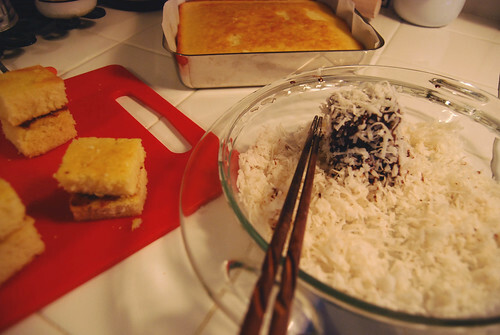 Allow excess icing to drip off; transfer square to bowl of coconut (left bottom). Using clean forks to turn square, coat it with coconut. Transfer coated square to wire rack to stand until coating has set, about 15 minutes. Continue until all squares have been coated. What a fun list! Another awesome aussie recipe you should try is anzac cookies, they are soo yummy! I visit Oz every year, and it ends up being a visit to playgrounds and parks with my niece rather than any particularly amazing places, but it is a fun place with warm, friendly people. As for volunteering, I think you might have a lot of fun volunteering with my favorite charity, Just Call Us Volunteers. I’ve tried your anzac cookies and they are wonderful but I should attempt to make them some time. I envy the amount of traveling you do: London, Australia, etc. Thanks for suggesting Just Call Us Volunteers. They look like a great organization that I would live to give some time to. funny, lamington’s are on MY life goals list. (as is a buche de noel). but swimming with any sort of iguana is not. i’ll stick to the cakes, thank you! and thank you for the recipe! Buche de Noel is also on my life goals list!! But it’s not in writing. Good luck with the recipe! 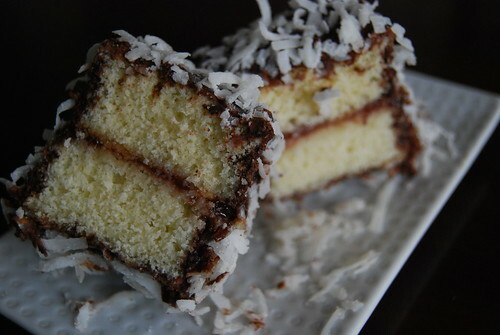 Those Lamington’s look so very delicate and lovely! Did you find them making them time consuming? @Jenny – loved your Anzac cookies!!!! They were so good but yes, they were time consuming. And so messy with chocolate coating. Ugh.